Were you to travel one segment of the Eisenhower Expressway in Illinois this morning, you might discover a curious billboard. The display features a mugshot of Ted Kaczynski, the self-confessed “Unabomber,” coupled with the question, “I still believe in Global Warming. 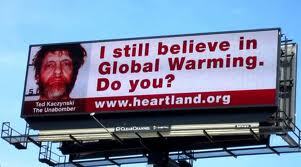 Do You?” The new billboard campaign lining various commuter routes is the latest initiative of the Chicago-based conservative think tank, the Heartland Foundation, to call into question prevailing scientific consensus around climate change. Predictably, progressives have responded virulently, claiming that Heartland has sunk to a new low in its effort to undermine and politicize “mainstream” science. In a scathing response, Andrew Sullivan of The Daily Beast characterizes the strategy as “a brutalist style of public propaganda that focuses on guilt by the most extreme association.” In other words, by linking belief in global warming to the likes of Kaczynski, Castro, and Charles Manson, all of whom presumably agree with the thesis of climate change, Heartland implies that anyone subscribing to such views must also be degenerate. While Sullivan’s critique is warranted, it also reveals something significant about the shape of American political discourse more generally. To borrow a notion from Roland Barthes, esteemed scholar of twentieth-century myth, American political discourse has become depoliticized. Barthes writes: “Myth is depoliticized speech… Myth does not deny things, on the contrary, its function is to talk about them; simply, it purifies them, it makes them innocent, it gives them a natural and eternal justification, it gives them a clarity which is not that of an explanation but that of a statement of fact.” (Mythologies, 143) Barthes wishes for us to see how myths transform historically situated and contested knowledge into concepts beyond the pale of critique. At first glance, the billboard appears to perform precisely the opposite function of myth; After all, isn’t it calling into question something which “mainstream” science simply acknowledges as “a statement of fact?” Well, yes… and no. Barthes also reminds us that all is not as it appears in myth. He writes, “myth hides nothing and flaunts nothing: it distorts; myth is neither a lie nor a confession: it is an inflexion.” Similarly, these billboards clearly intend to question global warming, and to associate this view with various serial killers, dictators, and cult leaders. Nothing is hidden here. The mythic component, however, operates at a higher order: It is the underlying assumption, as Barthes suggests, which inflects the meaning of the billboard for the passerby. By including Kaczynski, the billboard presents global warming as pathological rather than political. At least in American popular discourse, his actions represent those of a sick and demented mind, rather than a politically motivated individual (despite the vast amount of evidence that the “Unabomber” saw himself as utterly political). By extension, then, anyone who subscribes to the idea of man-made climate change must also be experiencing some form of mental illness. Curiously, in his critique of the billboard campaign, Andrew Sullivan merely inverts the main characters, reproducing the same myth. After carefully pointing out how the Heartland Foundation has rendered “the left” as some monolithic bloc of mentally deranged psychopaths for believing in global warming, Sullivan concludes: “Large sections of the American right are now close to insane as well as depraved. And there is no Buckley to reign them in. Just countless Jonah Golbergs seeking to cash in.” Here, he reduces the conservative audience towards whom these billboards are aimed to a mob of mentally deranged subjects. What, then, does this analysis of political squabbling accomplish? Well, employing Barthes’ lens exposes contemporary American politics as pathological, even bipolar. Each side deploys the language of pathology in order to construct an “other” that is neither political nor rational (perhaps not even human), but ill or evil. This strategy insulates one’s position from critique, as it simultaneously depoliticizes the issue (in this case global warming). “Something must be wrong with those people,” we say. Taking the attitude that “you can’t reason with a crazy person,” however, seems troubling to me, as I look out on a world filled with violence, suffering, and increasingly concentrated undemocratic power in the form of transnational corporations. Democracy, I was always taught, requires that we accord human dignity to others, even those with whom we disagree politically. It demands that we take our adversaries as thinking individuals; it asks that we assume that they, despite our differences, believe that they have the best interests of society at hand, and finally, it challenges us to engage in reasoned debate with one another to establish the grounds for practical solutions. Contemporary political actors on all sides instead engage in competing forms of myth-making, designed to dehumanize the opposition and depoliticize the issues. This entry was posted in James Dennis LoRusso, Open Submission, Politics and Religion, Religion and Popular Culture, Religion and Society and tagged Andrew Sullivan, Heritage Foundation, Roland Barthes, The Daily Beast, Unabomber. Bookmark the permalink.